Business leaders are in a wait and see mode on how the incoming Duterte administration will handle the economy. For a Dell Inc executive, “keeping the country safe” will boost the micro, small, and medium enterprises sector (MSMEs), and propel the economy to grow. “That’s the challenge for the government: for small medium enterprises to come up and have a bigger layer of the mid-market. 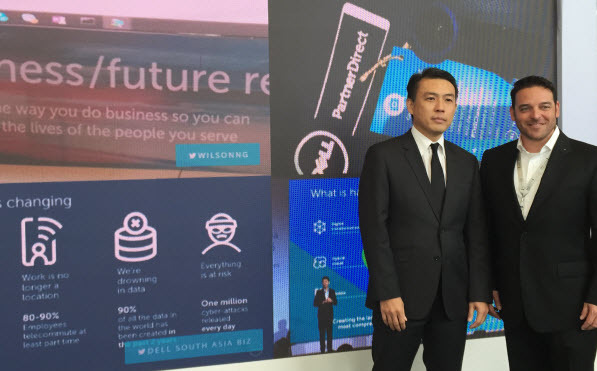 I think the government needs to take some risk and make the economy a pioneer,” Dell Inc. Malaysia Managing Director Pang Yee Beng told reporters in an event on Thursday, June 23. Beng believes beefing up the MSMEs can increase opportunities in the country, attracting investors in the process, including Dell. The executive is in town for the 2-day Dell South Asia & Korea Channel Summit in Taguig City. Dell has been aggressive on its business channel services, aiming to increase its revenue share in the company to as much as 50%, Global Director of Global Financial Services David Rodriguez said. “In FY (fiscal year) 2016 we made $500 million for APJ (Asia Pacific Japan) alone. We’re on track to make $8 billion globally,” Rodriguez added. To help achieve such, Dell’s working capital program has become more than as a solutions provider but an additional financial arm of its loyal clients. Think of it as an investment firm ready to provide additional liquidity for a channel partner, as long as the latter proves its loyalty to the firm. Dell may provide additional leeway to its payment system for the services it provide (by as much as 75 days for some channel partners) and increase a client’s credit capacity through its financial service partners. The company tapped GE Capital Commercial Distribution Finance, Wells Fargo Capital Finance, and IBM Global Financing solely for this purpose. “We want to invest with companies who are willing to grow with Dell. This is a key enabler not only for the company but for our partners too,” Rodriguez said. The program was only introduced in the country at the second half of 2015, where they invested in 11 channel partners spread across the industries of oil and gas, telecommunications, financial services, and government services for its first run. “We’re positive we’ll increase that in double digit numbers as we always do in the Philippines,” Beng said. The archipelagic state was one of the first countries in Southeast Asia to have the program, which is now available in 35 countries worldwide. Dell is looking into tapping its clients in Indonesia and Vietnam in the next quarter. The Bureau of Internal Revenue (BIR) fell 22.4% short of its tax collection target for May 2016 with only P152.14 billion ($3.26 billion), the agency reported on Thursday. In spite of the failing targets, this year’s collection is still 18.44% higher compared to the same period last year. Overall, for the first five months of 2016, BIR has reported better collection rate with a total of P659.96 billion ($14.21 billion) or 10.67% higher versus the same period last year. However, the number is still 20.86% below the target of P833.94 billion ($17.95 billion).